Almost 15 years after the events of 9/11, the United States continues to find itself mired in the Middle East, seeking to deal with a virulent strain of Islamic fundamentalism and the consequences of war, sectarianism, and a cultural and social breakdown in the Arab world that seem to have no end in sight. 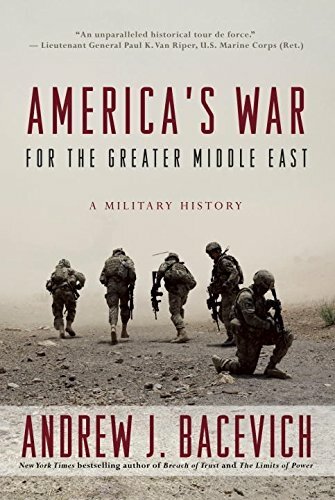 In this highly critical and acerbic new book chronicling America’s military engagement in the region by Andrew Bacevich, there are no punches pulled, no Administration spared, and no quarter given by the author. He lists with an almost evangelical fervor the multitude of strategic sins committed by the United States as it conducted over 30 years of military action in the Middle East. Beginning with the Iran hostage crisis and the Soviet invasion of Afghanistan, and ending with the Syrian civil war, the Libya debacle, and the never ending struggle for Iraq, Mr. Bacevich outlines how the U.S. has seemingly lurched from crisis to crisis, with no real strategy to deal with myriad problems occurring in the greater Arab Muslim world, or even to acknowledge the limitations of America’s ability to create a stable and secure region. Mr. Bacevich basic thesis that the United States has chosen to use military power as the primary tool for Middle East foreign policy with neither an achievable long-range strategic plan, nor even a basic assessment of what the U.S. seeks to accomplish militarily is well developed and difficult to challenge. For most of the 30 years covered by the book, the balance of ends, ways, and means for using military forces has been at best, not considered at all, or at worst, grossly mismatched, leaving the U.S. military in the position of trying to determine what their political masters want to accomplish and then trying to conduct military operations, often in a political vacuum. To be sure, Mr. Bacevich has a keen observation on the numerous faulty assumptions, poor to nonexistent understanding of the tribal, sectarian, and nationalistic influences in the region, and most of all, the gross over-estimation of American ability to direct and influence a wide ranging set of actors in the Middle East as he chronicles the United States military and it involvement in Iraq, Afghanistan, Libya, and even the Balkans. Moreover, like many observers, he notes that even though 15 of the 19 hijackers on 9/11 were Saudi nationals, and Pakistan has provided a safe haven for numerous terrorists, including Osama bin Laden, neither of these countries suffered significant consequences by the United States for their passive or sometimes overt contribution to Islamic extremism. Even significant military victories like Operation Desert Storm are given short shrift by the author, who points out that although the military achieved its goal of liberating Kuwait, which he acknowledges was probably all that could be accomplished within the prevailing political environment, the abortive Kurdish and Shia uprisings directly resulting from the conflict only served to deepen American involvement on the region. In his view, the imposition of “no-fly” zones over large swaths of Iraq to protect these groups from further retribution from Saddam Hussein only deepened America’s military role in Iraq and presaged the eventual Operation Iraqi Freedom to depose the Iraqi dictator. Bacevich likes to use the word hubris in this book, and although he wields it like a hatchet, his discussion points are painfully obvious. Beginning with the Bush Administration’s desire to “transform” the region into a bastion of Jeffersonian democracy, free market capitalism, and women’s rights, and ending with the Obama Administrations outreach to the Muslim world while still professing the desire of universal human rights, it is clear that successive Administrations have erred badly in their opinion that the Middle East is basically like Europe post-1945 or even post-1989. Far from a region just waiting to become like progressive and liberal America, the role and influence of family, clan, tribe, ethnic and sectarian group, religion, and even the inevitable rule of the strongman seem deeply ingrained in the region, and as Bacevich points out, the U.S. has neither the will nor the resources to overcome these forces of inertia. The increasing secularization and disconnect of America’s foreign policy elite are a primary cause of the misunderstanding of the underlying forces in the region, and unfortunately, the U.S. military has been left to try and carryout an impossible diplomatic and social effort. This is a harsh but necessary look at where America has been in the Middle East, and although Bacevich offers no prescriptions and at times lets his sarcasm get the better of his solid history, this book should be read by policy makers and military officers as a cautionary tale on the limits of military power and war making and as yet another example of how armed might should not be used as the primary tool of foreign policy, but as an instrument of last resort.